a. Auto drain function. The boiler bank will be drain after 3 minutes after system is off. b. Over heat protection. If happen to danger, the system will be shut down automatically. c. Protection for no water. If there is no water in tank, the system will be shut down immediately. 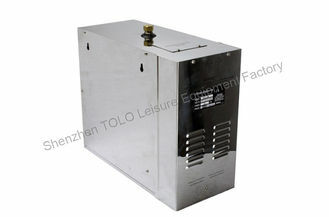 Every steam generator has through strict test, you can rest assured purchase. A. 2 Years warranty time guarantee. B. Help customers do trouble shooting project. C. Provide bathroom improvement and marketing solution. D. Supply final market support. E. Resonable price with high quality. F. Three times inspection during one production flow. G. CE,FCC,ROHS certificates are available. H. 24 hours to give you prompt and further information. I. Send invitation and arrange everything for you when you come to China. A. Send one inquiry or email. B. Check email and choose models in our catalogue. D. Confirm proforma invoice and arrange deposit.